Stuck at home last Thursday, felled by one of the many ailments that seem to be going around, I was feeling too weak to read so instead I settled down to watch Discovery channel’s “Klondike” miniseries, which I’d recorded when it aired earlier in the week. Set during the Klondike gold rush at the end of the 19th Century, it’s not a particularly memorable program, unless you enjoy spending six hours admiring Richard Madden’s hair (I certainly do), but it did serve to remind me of all the very bleak history books and historical novels I read during my preteens about life in the North during this period. 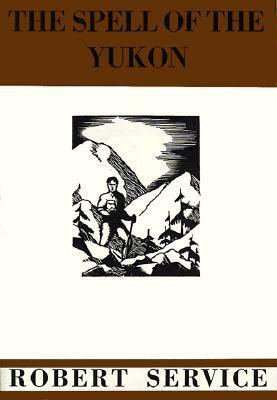 In this cheerful frame of mind, I picked up one of the most enduring books about (at least in part) the Klondike gold rush: The Spell of the Yukon, and Other Verses by Robert Service. I love Robert Service so much, probably because my father read them to me as a child and we had a fabulous LP of them being read. Sam McGee and Dan McGrew loomed large in my imagination. You’ve just inspired me to dig out my old Collected volume and wallow in some nostalgia! Service’s poems are wonderful for reading aloud, aren’t they? We had a teacher at my high school who would, if the class had been very well-behaved for a term, would recite either Sam McGee or Dan McGrew. He was extraordinarily good and it was such a treat. And even when I’m reading these poems alone, just to myself, I often find myself reading them aloud. They just sound so wonderful. And if you haven’t already, you could track down and read Laura Berton’s “I Married the Klondike.” Genteel Toronto Kindergarten teacher Laura goes to the Klondike to teach for, I think, year in 1907, and stayed until 1932. I read it years and years ago, Susan, but could definitely do with a reread!